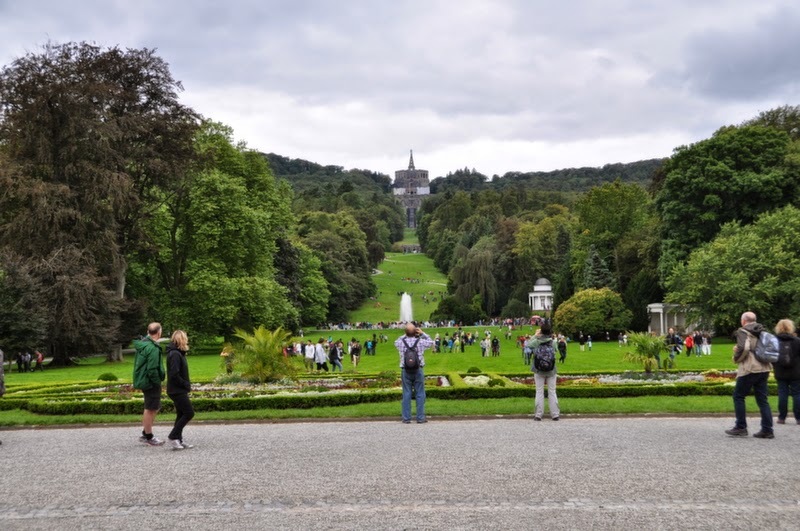 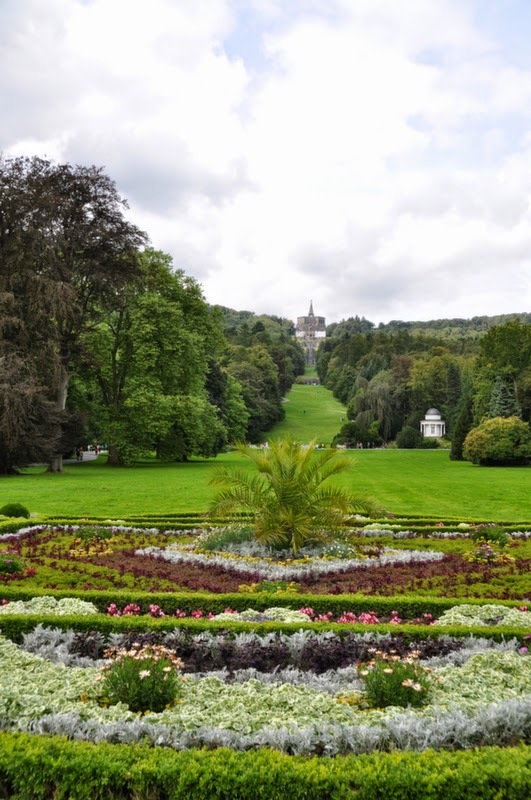 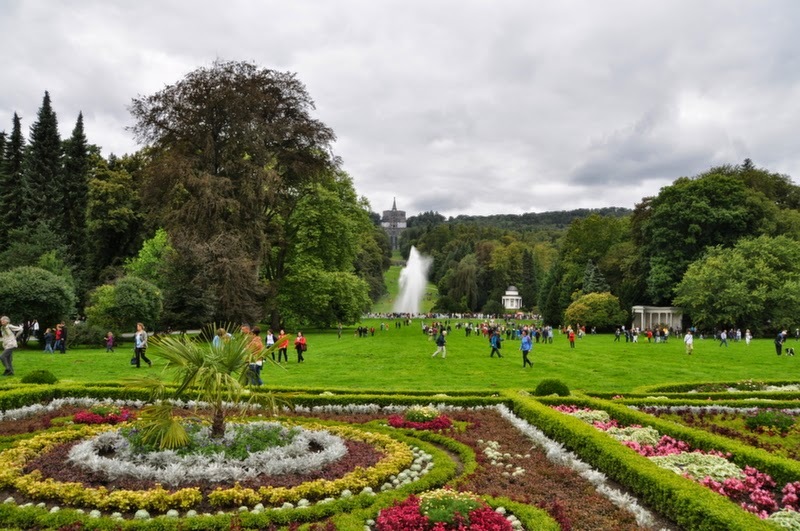 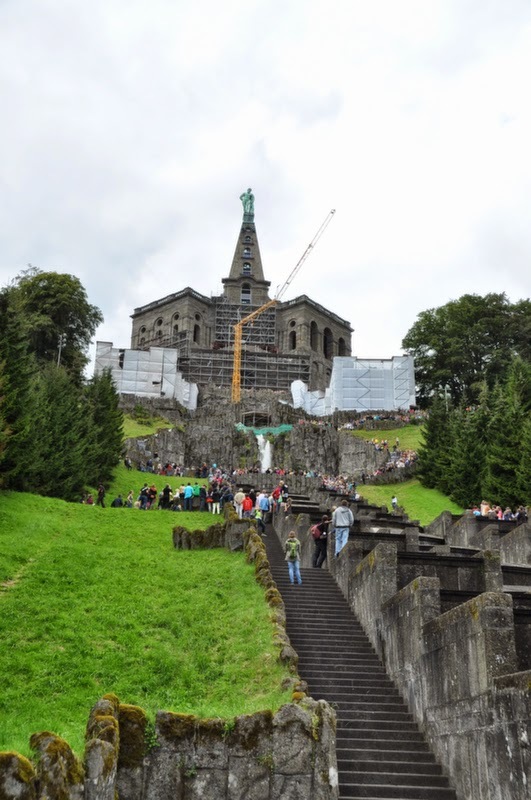 Earlier this year, on Easter Sunday to be precise, I visited the Bergpark Wilhelmhöhe hillside park in Kassel which also includes Schloss Wilhelmshöhe and Schloss Löwenburg. 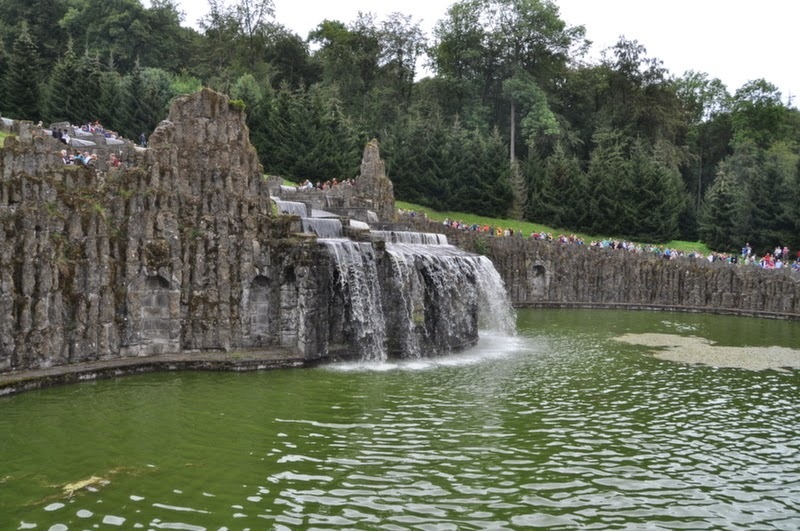 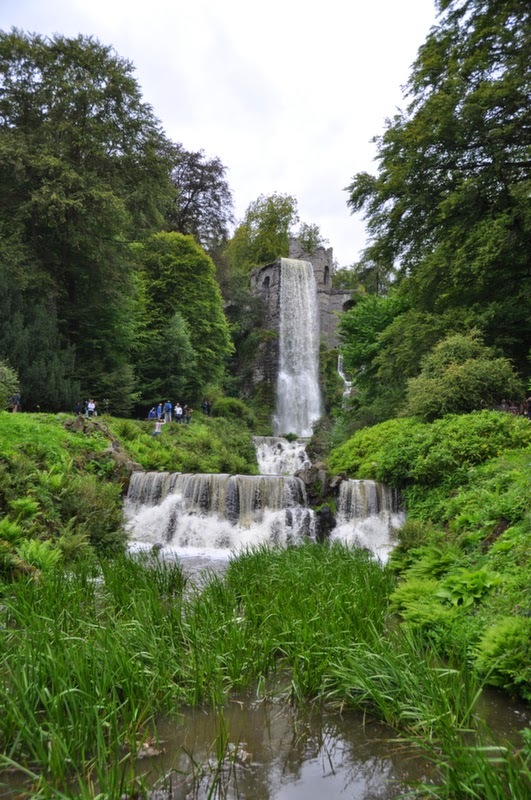 However, unfortunately the park didn't show all its splendour back then as the fountains and water works are only turned on between May 1st and October 3rd on Wednesday and Sunday afternoons. 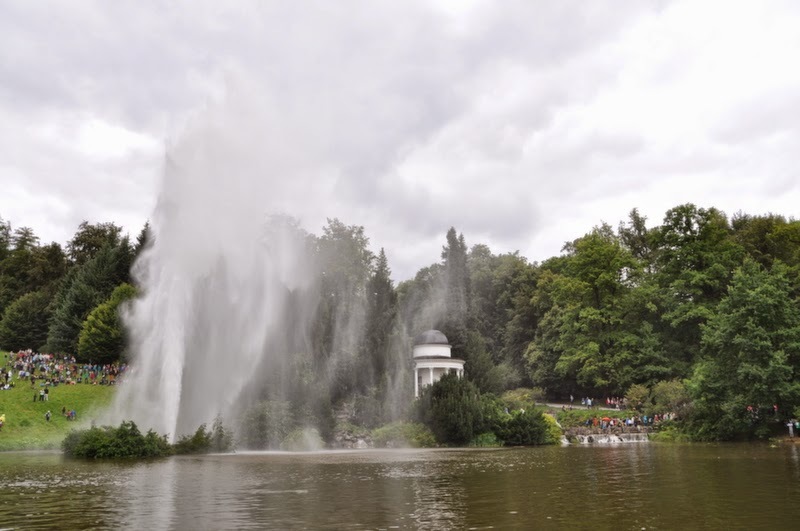 Last Sunday was finally the Sunday I managed to go back to Kassel to have a look at the park in all its glory and mind you, I wasn't the only one. 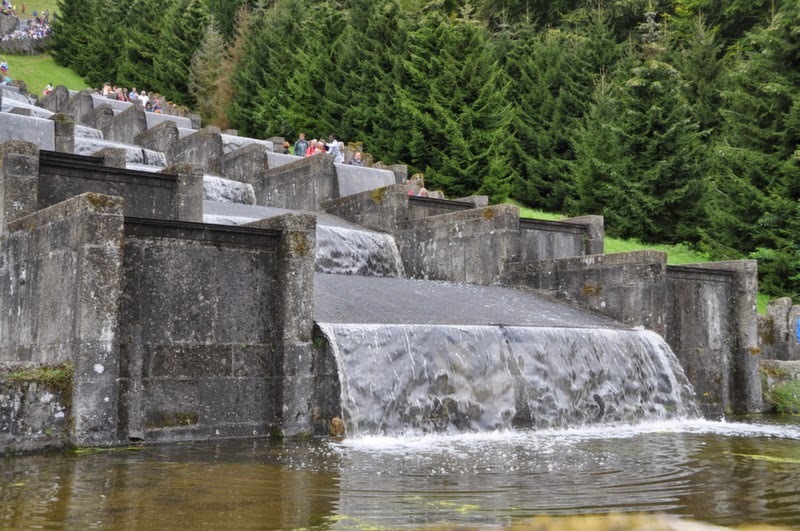 At pretty much 2:30pm sharp, an acoustic signal announces the start of the water displays as the air pressure generated by the running water causes the horns of the centaur and faun statues of the grand cascades to sound. 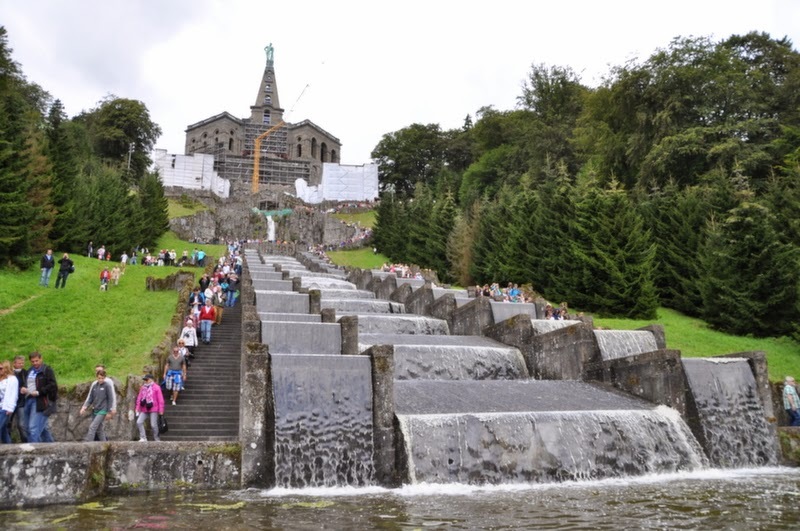 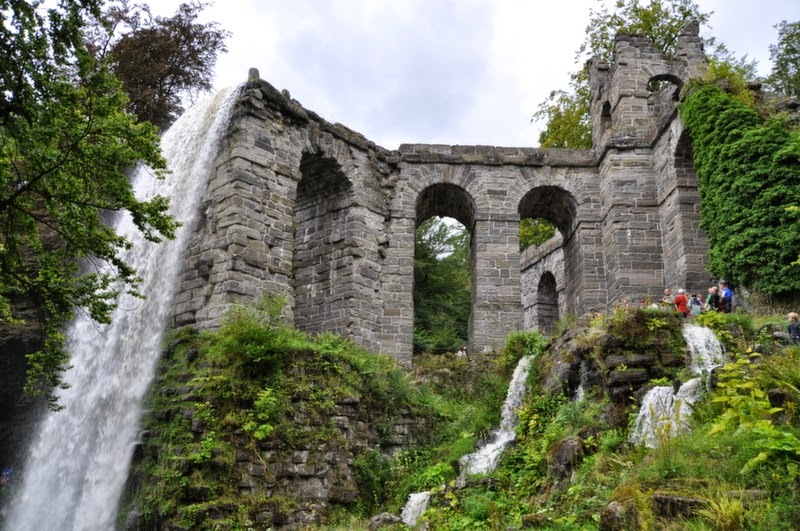 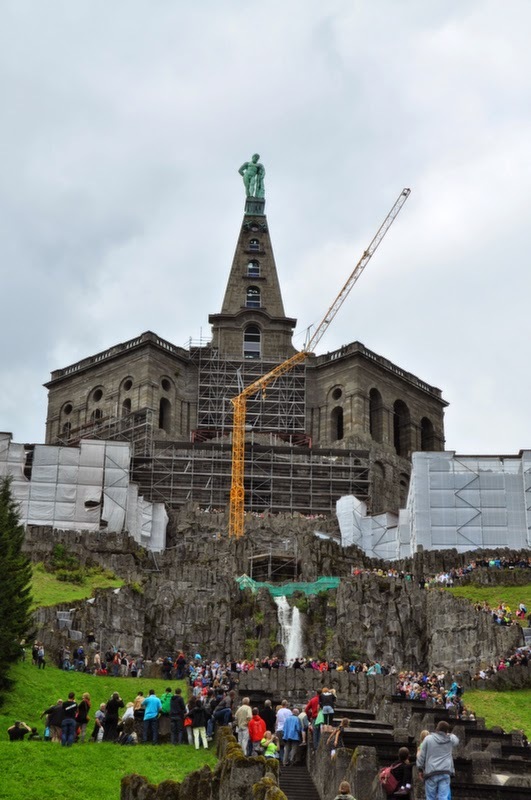 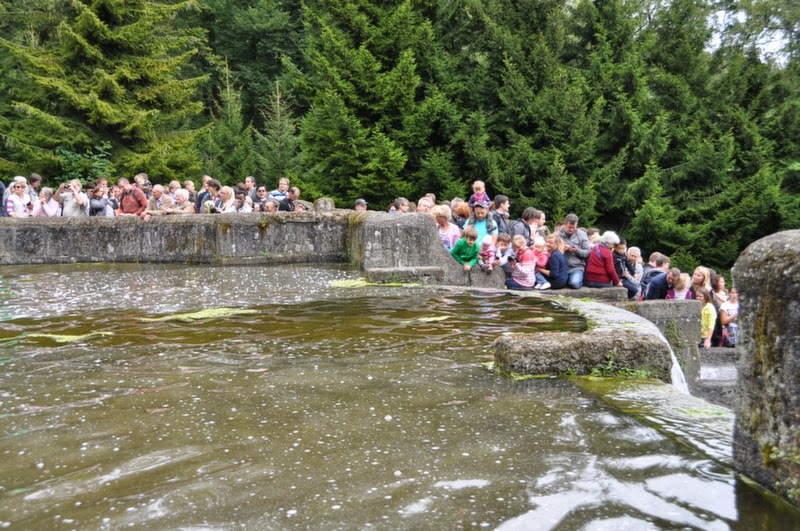 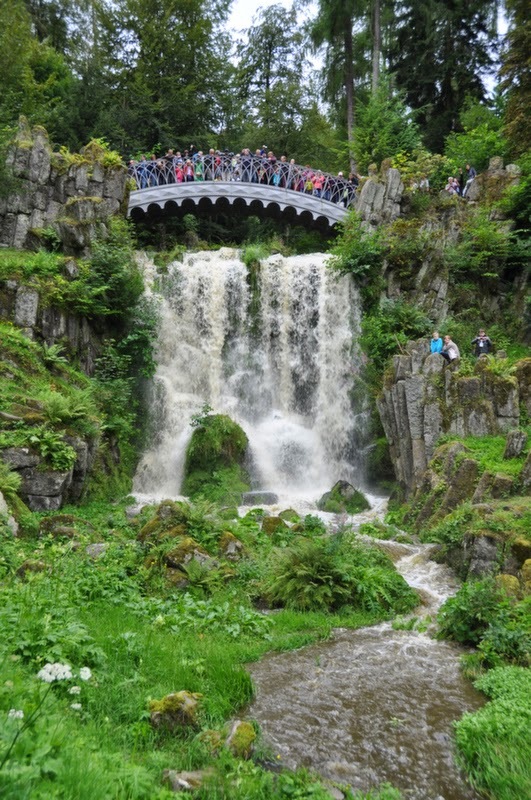 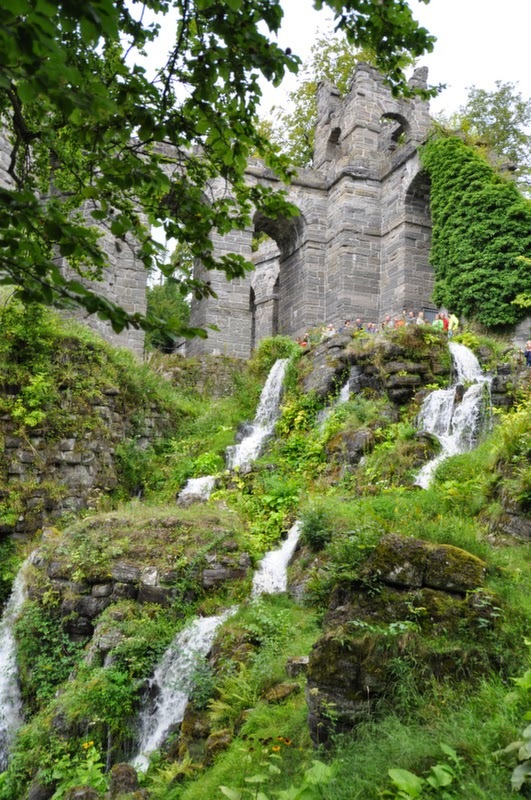 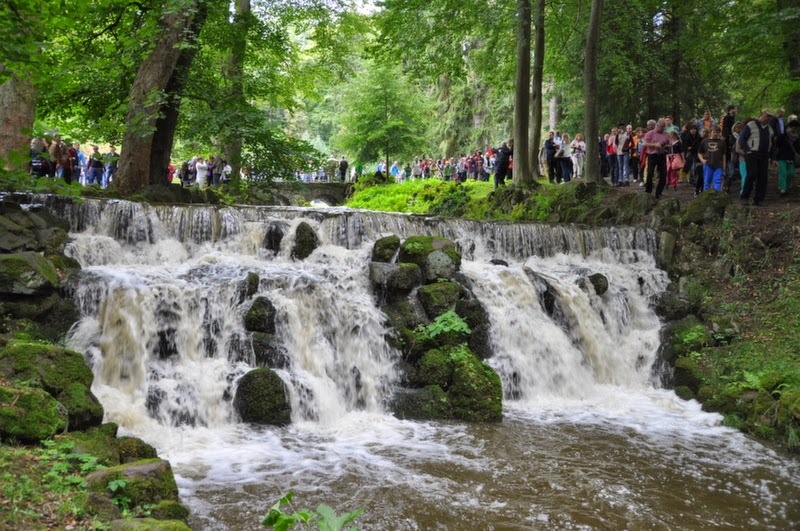 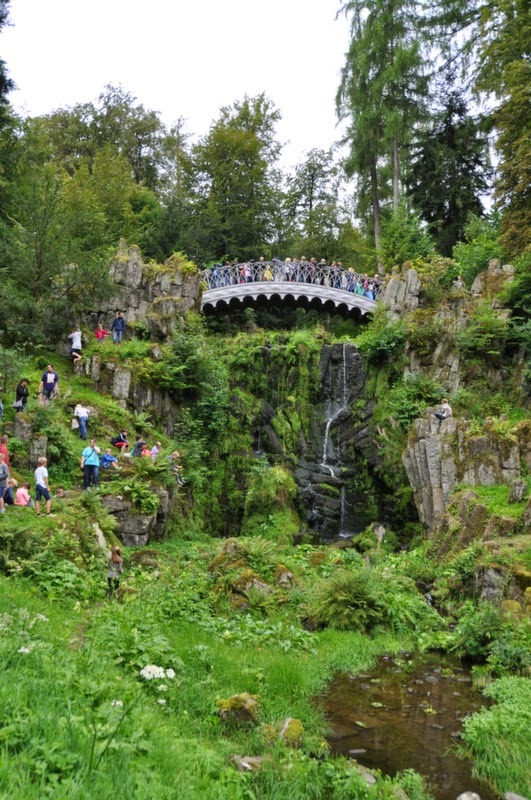 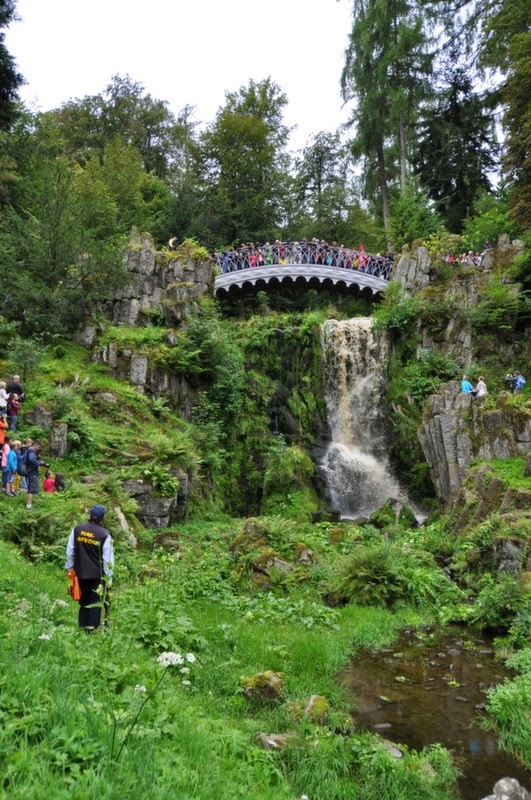 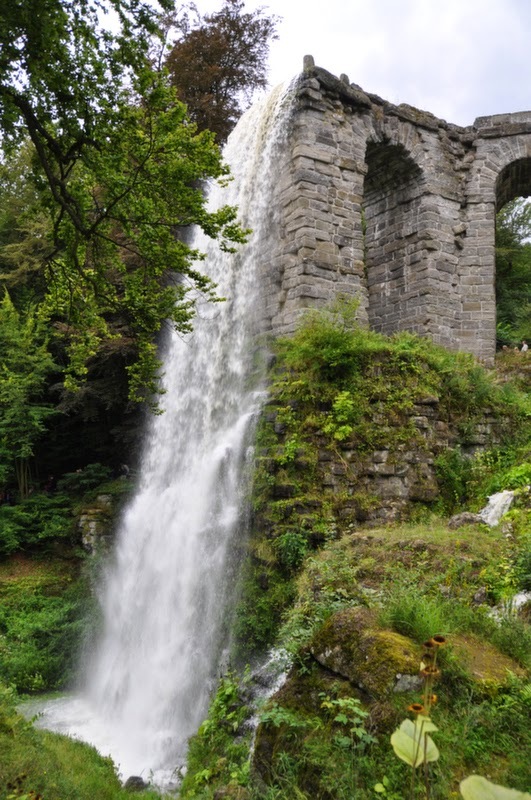 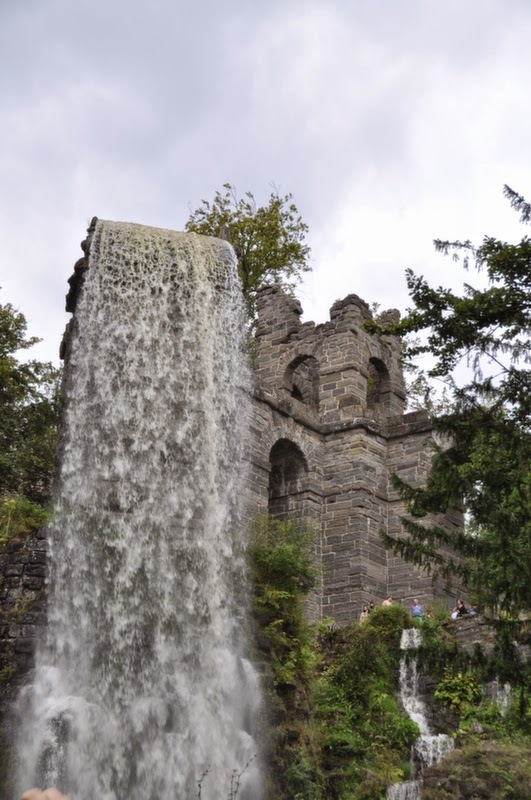 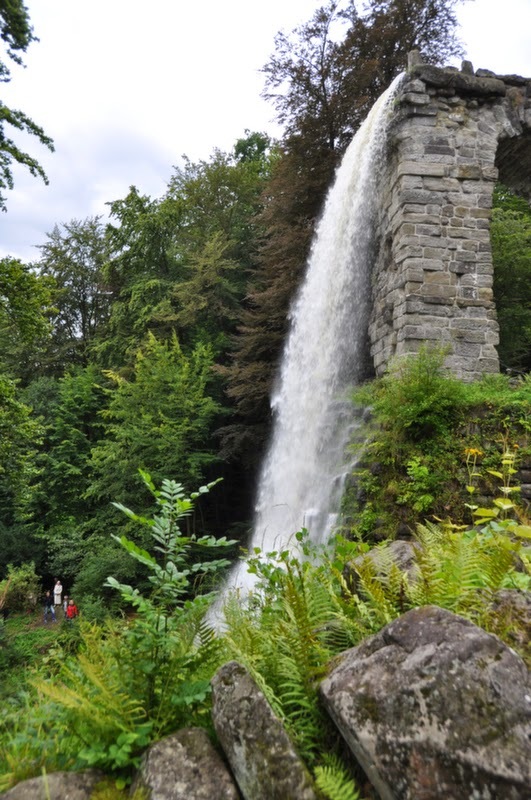 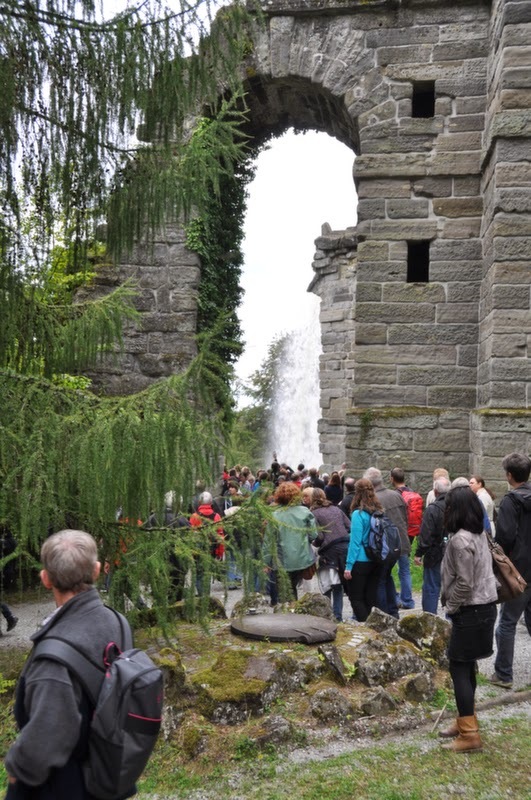 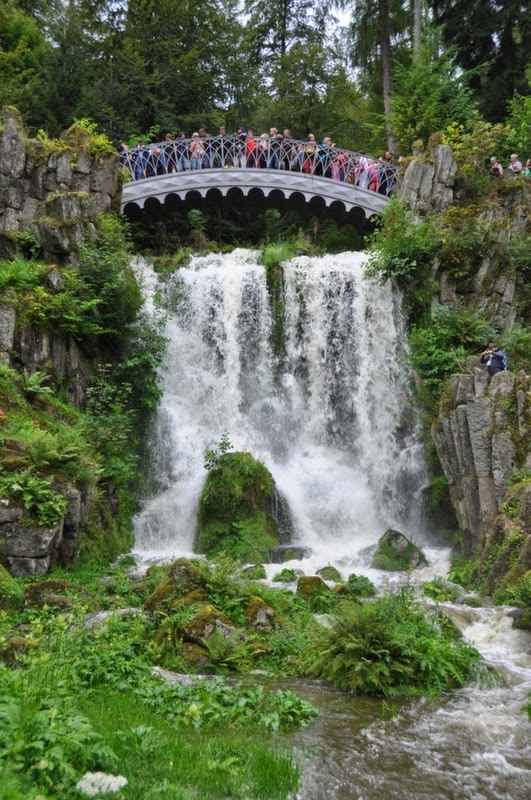 The sound marks the beginning of about 350,000 liters of water running down the grand cascades, the Steinhöfer's waterfall and the devil's bridge, until it tumbles down the aqueduct before arriving at the lake of the castle where a fountain of about 50 meters is situated. 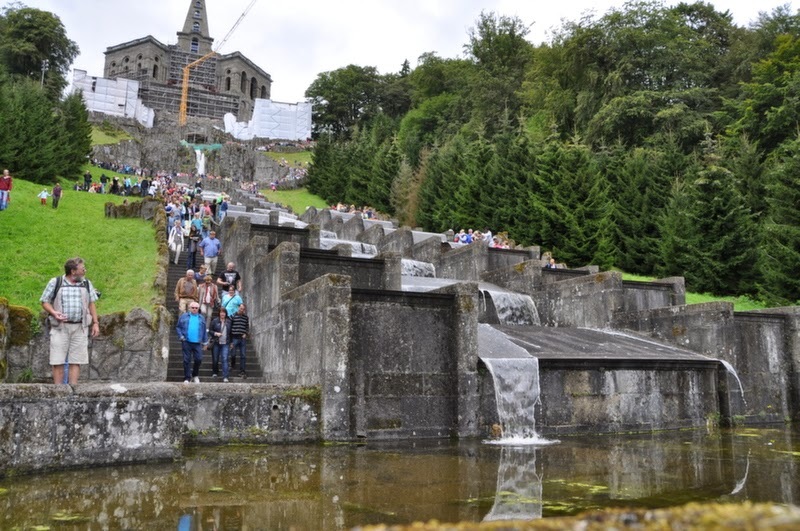 Together with the water, thousands of people make their way down the hill trying to catch all the different sights. 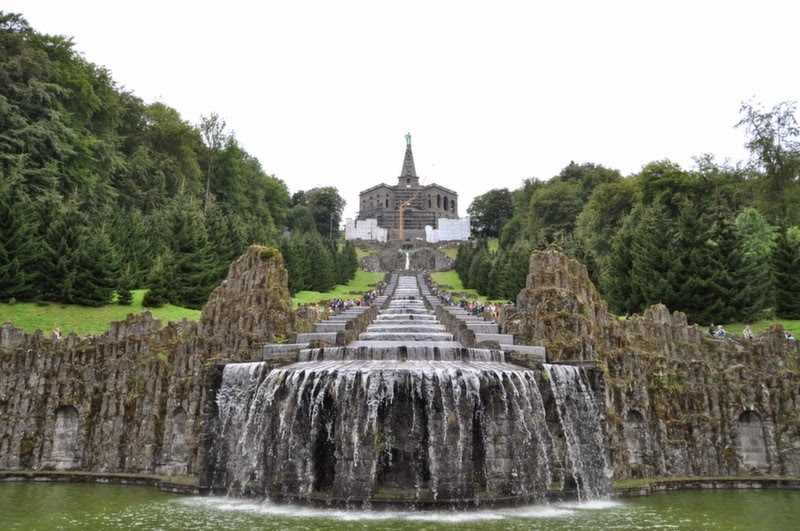 The Bergpark Wilhelmshöhe is admission free and open all year round. 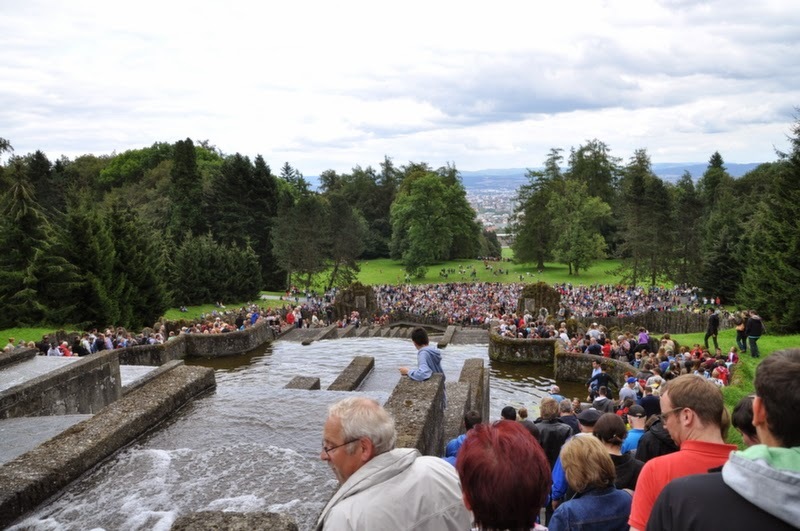 As mentioned before, the water is only turned on between May 1st and October 3rd on Wednesday and Sunday afternoons. 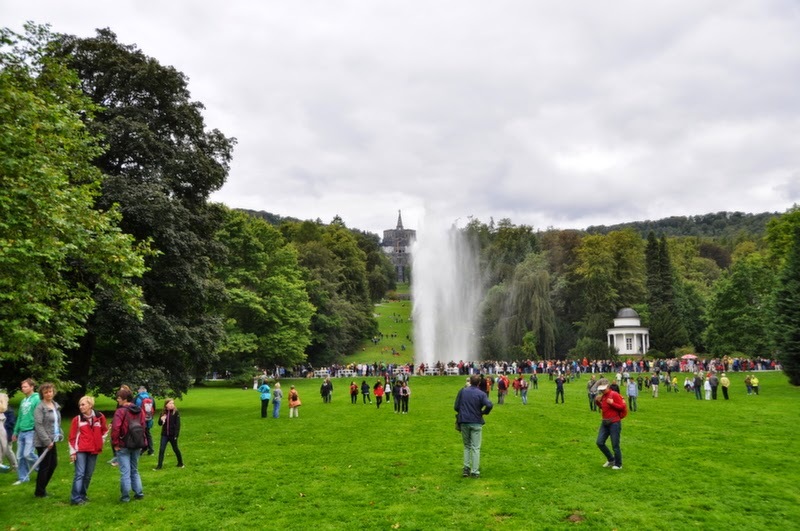 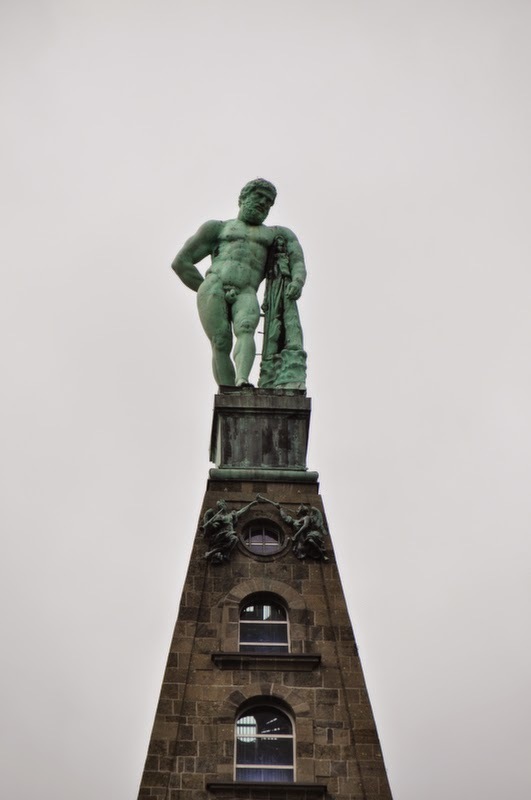 It's best to simply follow the water on its way down the hill so walk (or drive) up to the Hercules statue first and than simply follow its path down the hill. 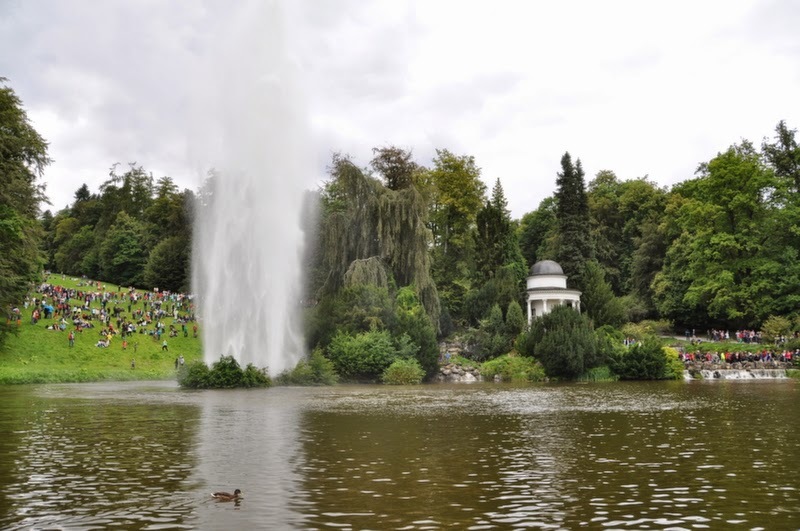 A museum is situated in the Schloss though if you aren't an art lover, it's probably not of great interest to you as it looks rather modern from inside. 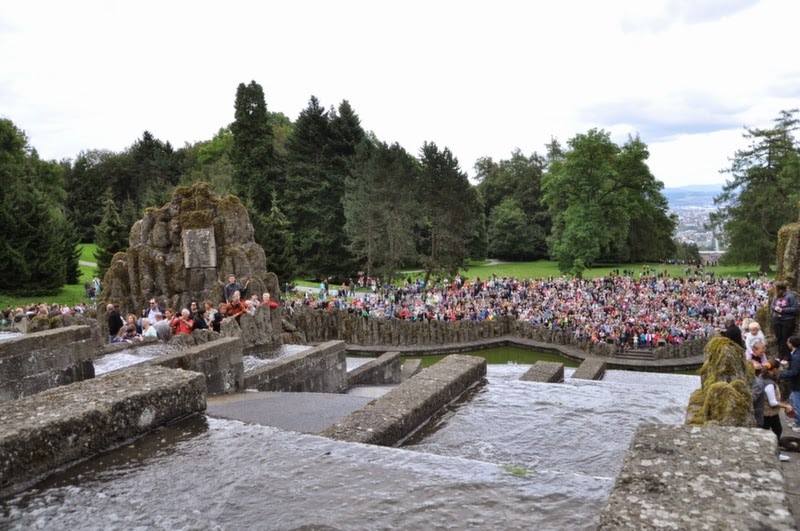 For more information, have a look here and here.